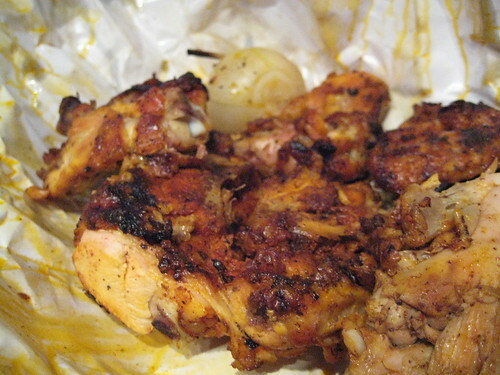 In a thread on Austin TX, tatterdemalion wrote: If it's nice out, you might consider going to a favourite place of mine for take-out only pollo al carbon (charcaol-grilled chicken) -- Pollo El Regio. Best chicken entree in town if you ask me. Juicy, charred whole chicken with a slightly spicy but potently flavourful marinade. And if the spice factor isn't enough, a whole chicken order includes a very spicy avocado-based green sauce that packs a punch. Also comes with another red salsa (not as hot) and some very good, albeit commercial corn tortillas, barracha beans (with good chunks of bacon and plenty of flavour), small portion of mediocre rice, and juicy charred whole onions. All for $12. Sit outside at the picnic tables with the family if it's not too hot out. El Pollo Regio, the Texas-based Mexican chicken chain has come to Chicago(land). Tatterdemalion's description of the Austin restaurant fits the Melrose Park location, right down to the outside picnic tables. There are some inside tables too, as well as a drive-thru window. I first noticed this place on Lake at 20th because of the huge volume of smoke it was pumping out. I have little to add to tatterdemalion's description above. Chicken is spicy and juicy—great stuff. A half chicken with all the extras is $7.99 (Mon & Tue from 10-1 you get a drink too). This is either very strange or not at all. There was some recent uproar down here due to the abrupt closing of (at least) two of their locations, one of them being my standby (and IMO the best one). Last I heard one of them reopened, but my beloved still appears shuttered. On another note, I should amend my previous comment about their green sauce being avocado-based. I've been experimenting a bit trying to recreate this at home, and based on my (and others') conclusions, avocado is not an ingredient, and it appears to be a mayo-like emulsion with peppers (jalapenos/serranos/habs) for sure, and a few other ingredients which are still questionable (egg, onions, crema). It's a fairly common salsa around here, but for some reason, El Regio's is far and away the best in town. Thanks for the report, Rene G.
tatterdemalion wrote: This is either very strange or not at all. I had lunch at the Melrose Park location today (thanks Nab and Rene G!). They claimed (without prompting) that the green sauce was avocado based. It surely has a good number of serrano peppers mixed in. I found this sauce to pack a nice punch and to be a good accompaniment to their chicken. I first noticed this place on Lake at 20th because of the huge volume of smoke it was pumping out. I too "discovered" this place first by smell- on my way West on Lake Street last week. Not too busy when we went at lunchtime today- after asking about other locations of El Pollo REGIO, the manager gave me a card that shows them having about 9 locations throughout Texas. If you ever want to try Don Alfredos Carnitas for lunch (just a bit further west on Lake @ 25th) on a MONDAY, keep this place in mind for a backup- Plan "B"- because Don Alfredos Carnitas is "dark" on Mondays! 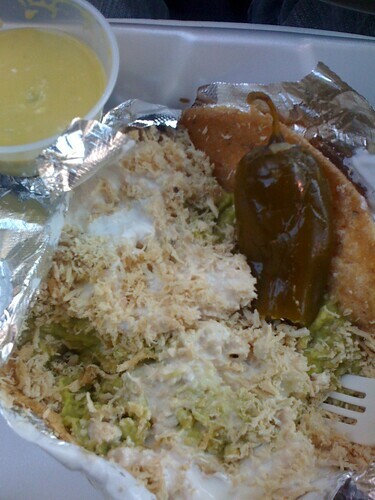 stevez wrote: They claimed (without prompting) that the green sauce was avocado based. Well ain't that a pain in my arse - back to the drawing board. Although they have said down here that there is no avocado. Nice to see they're even using the same 'wax' paper blanket. I also tried the chicken this past Sunday and was really pleased. The chopped up chicken had great flavor without the awesome green sauce and the chicken combined with some onion and the sauce in a tortilla was a good taco. The chopped up half chicken reminded of how they serve the jerked chicken along side the roads in JA. That green sauce is really addictive, I went thru two for my half bird. huge meal and nice deal on the price. The sides were ok but the sauces and bird were really good. The Tex-Mex cookbook has a recipe for a green sauce from Mama Ninfa that is somewhat similar. It includes tomatillos, serrano (seeds left in for hotter heat) avocados, crema and cilantro and salt and pepper. Its always a hit when I make it and its what iIthought of when I first tasted the green sauce from Regio. Da Beef wrote: The chopped up half chicken reminded of how they serve the jerked chicken along side the roads in JA. Yeah, I'm with you there. Although the flavor profile is obviously different, this is the closest in appearance to Jerk Chicken that I have seen in Chicago, as opposed to the sauced, stewy versions that most local jerk places are putting out. tatterdemalion wrote: On another note, I should amend my previous comment about their green sauce being avocado-based. I specifically asked if the green sauce was lettuce based, response was no, its avocado. Sauce is terrific either way, spicy hot, smooth, a perfect compliment to the chicken. Chicken was juicy, authoritatively spiced with points of crisp skin. I brought a piece home which the bride commented favorably upon, in particular the green sauce. Thanks Peter and Nab, I hope they open one closer to my house. So I slid into Regio today- not super hungry-just in the mood for a taco or 2. I asked if they made any (tacos) from The Pollo al Carbon. Then, I noticed that they did have a menu item, of Tacos al Pastor (and a quick look at the grill area- revealed no "spit" in sight- disappointing). So, I asked- can I have the Tacos al Pastor- 1/2 and 1/2.....al Pastor and Chicken? After a quick check w/ the Grill Man- and a "Si"- led to a plate- that could be a new menu item. nicely topped off w/ Onions and Cilantro! A very tasty twist on tacos al Pastor! OH- and the best part? They now are serving Tortillas al Mano- Handmade Corn Tortillas- no more Machine Made tortillas- very tasty upgrade, made over the past weekend. Stopped in the other day. That there is a nice and tasty bird. While the breast meat was a tad dry at the edges, the remainder of the chicken was moist, flavorful and had a nice kick of spice to it. I loved the fact that the chicken came wrapped in wax paper and already chopped. . although I wonder how long they will serve a bird that's been off the grill and wrapped. I also got the asada taco. Not recommended. The meat was tough and actually bitter.. . . i know, I am still trying to figure that out. Perhaps they used bitter fruit to marinate it in order to tenderize a tough cut of meat. Either way, i'd stay away from it and stick with the pollo. Well, I've been so bummed by not being the first to discover this place, being practically in my backyard and all , but I did finally get a chance to visit today. Yes, what indeed took me so long! First, to echo the claim above, the tortillas, while not the lush corncakes of Quebrada, are nicely done. A welcome addition indeed. Second, I have nothing new to add to the chicken comments. Third, as to the salsas, I too believe the green is avocado based; such sauce is also popular in SoCal. It may look like the S. American salsas at Senor Pollo or such, but the flavor is much different. But anways, no one's mentioned the chunky salsa in the molcajete gigante near the counter. Something like a cross between Quebrada salsa molcajete and a pico de gallo, with chunks of avocado thrown in for good measure. I also ate it as a salad. Fourth, has anyone mentioned the beans. Someone should introduce these to the Pollo Campero folks (and I've never disliked PC's beans). Fifth, what about the tacos banados a/k/a tacos estillo tlaquepaque (a word the counter girl could not even pronounce!) a/k/a barbacoa tacos. These were as good as the chicken if not better if that tells you something. Sixth, can we have a sixth, what the pray tell RST when you need him, is the explanation behind tostada estillo Siberia! Dunk Donut for desert, que rico. - Still not sure what's Siberian about said tostada, but ordered one to find out how it tastes. It's hard enough avoiding the barbacoa tacos as a chicken side, but this chilly treat was a treat. OK, it was not the least bit chilly. It's two very large fresh tortillas fried, think almost the huaraches on Maxwell (less the black bean stuffing). One is place on the botton and smothered with avocado. Then comes tons, I mean a lot, of very finely shredded chicken (neatly divided between white and dark meat too). A big squeeze of sour cream and then the second tostada. - If we really needed any more encouragement, at lunch, there is now, until who knows when, this deal: buy a whole chicken (pollo entero) and get a half chicken (pollo medio) free (gratis). FWIW, I did learn the the basis of the cuisine, it's historical antecedents and style, is that of Monterrey, Mexico. Also, FWIW, there is actually another pollo al carbon, with live coals and tortillas hecho a mano, a few blocks west on Lake. For the sake of science I should try, but I have a hard time believing any place can be as good as Pollo Regio. the way to do this place is to get the pollo entero and extra green sauce. you don't really need the red sauce so you can opt out and just ask for a few more green. you take the homemade tortilla, shred up some charcoal chicken into it, add a few pieces of the onion and pour on the green sauce. take a bite. it will be one of the best "chicken tacos" you've ever tried. you might want to consider extra tortillas and an extra onion. the rice is ok and the beans may interest some—they are almost like a soup. Vital Information wrote: - If we really needed any more encouragement, at lunch, there is now, until who knows when, this deal: buy a whole chicken (pollo entero) and get a half chicken (pollo medio) free (gratis). That deal was all the encouragement I needed. Stopped by, got the 1.5 chix (about $15), figured I'd eat half. Did. Then started digging into the whole bird before conscience kicked in. Very tasty, moist inside, crispy char outside, lush with chickeniness. Beans were a surprise, in a good way: as mentioned, almost like a soup, and I thought I detected some pig skin floating in there, quite flavorful. The meal deal is available from 10AM - 2PM. Well worth it. One word of warning about the chicken - I stopped by at about 6 pm last week and picked up a whole chicken. They pulled it out of some big warming oven, already in a bag, and while the outer flavor was great, it definitely was a little dried out. I suspect all the aforementioned reviews about the moistened chicken were lunch-time endeavors, and that by dinner the chickens have been sitting around a bit and have dried out. I will have to see if they can make a "fresh" one for me next time (dinner is the only real logistical time I can swing by the restaurant). I've been very happy with the chicken, salsas, and handmade tortillas at El Pollo Regio; that morning deal and the fact they start serving at 10 AM makes it great for a stop early in the week, for an immediate hot lunch or late breakfast, and then for a beautiful charred carcass to pick at for flautas or soup or chicken salad that night or the next day. Their pricing on other items is a bit bizarre - no real single tacos (I'm still waiting for this place or El Paisita to offer char-skinned chicken tacos for $1-2 a piece, which I think would be good for business, particularly for new visitors who don't need a whole bird), no drinks under $1.95, extra charges for takeout salsas (other than what comes with the listed combos) even though they have a big bowl of good pico de gallo out for eating in. Tacos al pastor are order-able in groups of five but not solo, and I had forgotten Hombre's half-and-half trick. is the "giant chicken taco," which was tasty, but which disappointingly just has the abovementioned super-finely-shredded white meat chicken with no skin, and is (or was last week) served cold. The tortilla for this big guy is thick and good, but the dressings are somewhat redundant with guacamole and sour cream on the taco, and then the salsa being the avocado-crema one. I'll be back this week for my chicken-and-a-half for crispy-skinned tacos at home. Good place. Went for lunch today- as the gal was posting a sign in the window. I "knew" something was off/amiss, when the aroma of the place didn't draw me in from 25th Avenue. 2 days ago- the Owner decided that the location wasn't "working so good". So- they're packing up the equipment, to move- to as yet undisclosed location. DonCarnitas, was just NOT as satisfying. I drove by this place on my way to Five Guys in Oak Park. I knew it looked familiar - I saw the pictures from this thread before! Ram4 wrote: I drove by this place on my way to Five Guys in Oak Park. I knew it looked familiar - I saw the pictures from this thread before! You are now a bonafide LTHforum member. There are many places I know from this forum that I drive past and can provide reasonably detailed information. Have I been there? Not always, but I read about it here. Thanks Cathy! Even though I live in Highland Park, I work in Addison, so I do get to have things that aren't close to home. I'm hoping to work from home soon, so that means special trips for all my LTH related needs. Yes, the place smells like Pine-Sol, but the chicken is solid. Sides and salsas are unfortunately not in the same league as Pollo Regio. Call your carbon orders in ahead if you don't want a 20 minute wait. But where am I to get my Siberian tostada! This just sux to high heaven. It seems like a good as place as any. I mean Lucky Dawg seems to do ok (not that I've ever tried), but then again, nothing ever can replace the Come Back Inn. Vital Information wrote: This just sux to high heaven. It seems like a good as place as any. I'll be interested in seeing what better place they find. The owner isn't messing around. Even the signage is gone now. Hi to all. I found your forum while searching for a recipe for the wonderful "green sauce" at El Regio. After reading all of the posts I was so bummed for you guys!!! You no longer have an El Regio? I recently discovered this place here in Dallas and had no idea they were so "big" elsewhere. As I sit here, eating some yummy chicken and green sauce....I am so sad for you. Sometimes we go just for the green sauce. We eat it on all sorts of things. I have tried to re-create it myself and have been unsuccessful. (I did, inadvertently, create some sort of other tasty green sauce but it is not even close to this stuff.) I hadn't thought about using crema. I used sour cream and milk. So thank you for the ideas you gave me and I wish I could share my El Regio with you. Tex-mex is my favorite. Good thing I live in Texas!